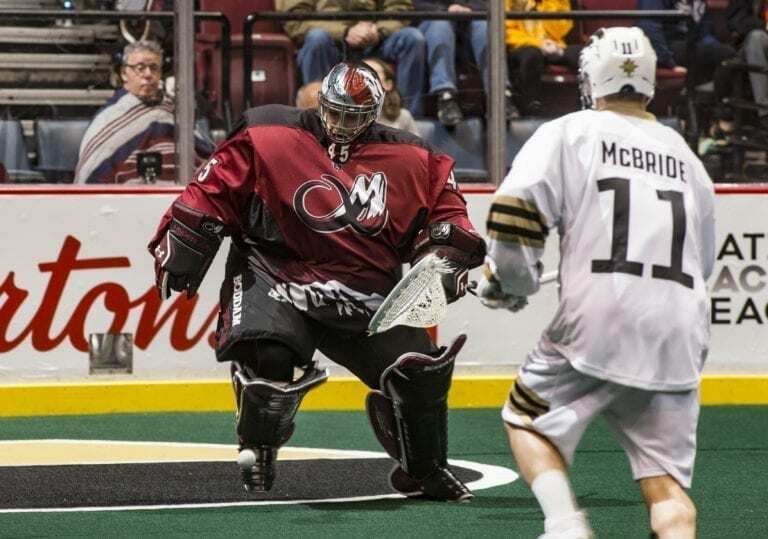 For the Colorado Mammoth (3-7), where does two straight weeks of losing efforts land you? Well, they’re fourth in the West and clinging to the last playoff spot by half a game. Vancouver (3-8) is right on their heels, and like many have been saying this season, the Warriors’ record is deceiving. Vancouver is a dangerous group, and they already have a game in-hand in terms of tiebreakers on the Mammoth, while two more matchups await them (a home-and-home series on March 22 and 23). Not to mention, seven of Colorado’s last eight games are against NLL West Division opponents. It’s a toss-up whether Colorado or Vancouver has a tougher road to the finish line – Colorado plays Saskatchewan twice; Vancouver has to play both Saskatchewan and Toronto — but Vancouver has played one more game than the Mammoth and has the worse record, as of now. And although Colorado hasn’t proven that they can string wins together just yet, there’s still plenty of time left to figure things out and solidify their playoff chances. Right now, I’m being a realist, and they’re definitely looking up at everyone else in the West, but no team has set themselves apart from the pack (Saskatchewan is first with a 6-4 record), and that’s been a major theme of this season. If the Colorado Mammoth can get their act together, they’re more than capable of stealing a game or two down the stretch. If anyone has anchored the Mammoth this season, it’s Dillon Ward. He hasn’t played lights out every night, but he’s been competitive and solid, and without him the Colorado Mammoth would be far worse off. That being said, the guy is tired. The whole team is tired. And it showed against the Black Wolves (7-4) on Sunday afternoon. Ward gave up 16 goals (there was an empty-netter) on 44 SOG in a 17-11 loss. But after holding the Rush to just 8 goals on 48 SOG the weekend before, something had to give. Although the Mammoth hung in there with New England early on – it was 5-4 New England at halftime – the Mammoth defense collapsed in the second half, giving up 12 goals, while the Mammoth offense could only muster another seven goals. But that’s the way it’s been going this season, in terms of offense. No goal support means you’re going to have a tough outing each night, although Eli McLaughlin had himself another great showing, with four goals and three assists, and Ryan Lee went 2-and-4 for six points. But up to this point, defense has been the Mammoth’s bread and butter, and the dam finally burst. Honestly, I think Colorado wore themselves out in the game against Saskatchewan, so much so that they were playing catch-up with New England all game. They’re usually a strong team through all four quarters, but in the last nine minutes of the game Sunday, they were outscored 5-1 and the game was put out of reach (it was 12-10 New England at that point). Not making excuses, but their legs just gave out. Callum Crawford’s fourth goal (he had four goals and seven assists on the night, and whether or not he should have been playing at all is a discussion for another time) came with less than a minute left, as he was left all alone on the doorstep and turned Ward inside out. There had been a major lapse on the defensive end, as both defenders doubled the ball carrier and neither had time to recover. In that type of game situation, sure, you want to double the ball and get one more offensive possession, or at least get it out of your end, but this lack of mental awareness spoke not only to the team’s state of mind (I mean, they were down 16-11), but to the fatigue they were feeling as well. These guys need a spark of energy, and Ward needs a break. Hear me out on this one, but this Saturday night, when they take on San Diego at home, how about they start Steve Fryer. In limited minutes last year, he proved that he could take charge of the crease if need be, and it’s about time the Mammoth called on him again. What’s the worst that could happen? They have to put Ward in halfway through the game, cold? I’d take my chances. The Seals already stuck it to Colorado once this season, and they’re probably game planning for Ward to be in net, so why don’t the Mammoth just flip the script and start Fryer? If it’s one thing I’ve learned in all my years around the game, it’s that coaches are always scheming, and even though Ward might give you your best chance to win each night, sitting him may just send a message to the team that they can’t lean on him so heavily anymore. Faceoff against the Seals is Saturday, March 9, at 7:00 p.m. in downtown Denver.